After plotting your geography data in Power Map, you can use the Layer Pane to change the look and feel of your data on the map. By default, Power Map shows a column chart, but you can show a bubble chart, region chart, or heat map instead. 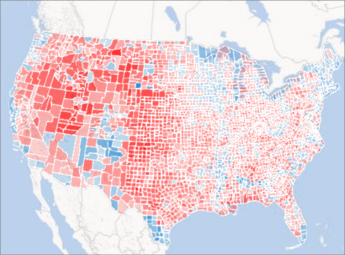 Here’s an example of a region chart that shows voting preferences by county for the major political parties in the United States. 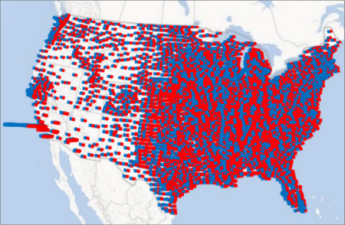 The deeper the red or the blue color, the higher the percentage by which a particular party leads in an election. If you don’t see the task pane, click Home > Layer Pane. Under Geography, check the boxes of the fields you want to show on the map. This list will show different fields for different data. If Power Map doesn’t show the chart you want, you can change it. Pick a Stacked Column, Clustered Column, Bubble, Heat Map, or Region chart. When you apply a heat map, the Height box changes to a Value box. You can change the way value fields are aggregated, by clicking the arrow in the Value box and picking the function you want. Typically, Sum is applied by default, but you can pick Average, Count, Max, Min, or None. You can also remove a value field from the Value box. If you drag a field to the Category box and leave the Height box blank, Power Map automatically adds that field to the Height box and draws a visual that represents the count of each category. Instead of dragging fields into the Height and Category boxes, you can just check the field boxes. 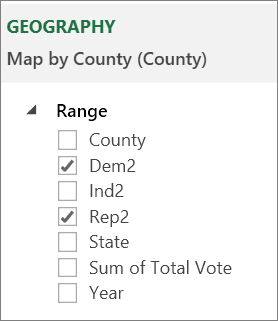 Power Map puts those fields in the appropriate box.